I recently got mt 3rd Williams target knob peep sight for my .30-30. I'd like to put a knob style lock screw on it like I have on the 2 others I have but I'm not having any luck finding one. The one I got from Brownells is too long. The first I got first lock screw off eBay but I can't find one there now. The second one came with the lock screw. I'd like to get another so I don't have to use a screwdriver to adjust my sights. Anybody have any ideas on where to get one? You need the gib lock knob. Part #61613 is the Williams part number which is what Brownell's sells, same as Buff Arms, perhaps they sent the wrong part. A quote from the Brownell's site for the Gib lock knob from the link Tim provided: "SPECS: Aluminum, black, anodized. Steel screws. This may require fitting by grinding the tip of the threads to fit some sights." It seems to me that they are aware that the shank is too long for some of the Foolproof sights and you need to grind it down shorter. Just a thought. Here's a pic of the screws. 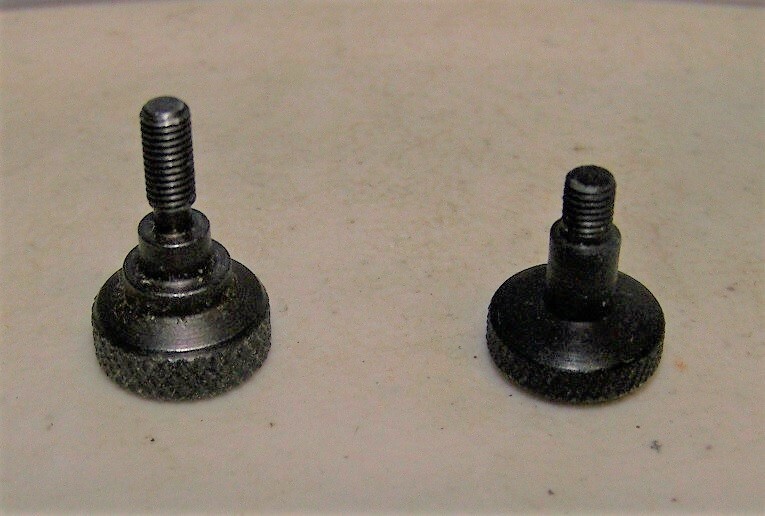 The one on the left came from Brownells and the one on the right came in a target knob sight I got from the accessory barrel program awhile back. The one I got off Fleabay a few years back for my .45-70 is the same. With a fine mill file bevel the end of the screw after grinding it down or after filing it down. Trick will be holding the screw while you work on it. Pin vise or drill chuck holding the head might work but too much pressure on the screw will send it flying. The guy selling them on eBay is back.